Charlie’s Machine & Supply is a worldwide leader in the distribution of Carrot, Onion and Potato peeling equipment; Leafy produce & Melon Washers; Carrots, Onions, Tomatoes, Potatoes, Apples - if it can be cut we have the equipment to Cut, Dice, Slice, Wedge it; Lettuce, Broccoli, Onions Dryers; Pack & Box; Scales; Sealing; Conveyors; Blades and Knives; Spare Parts and Chlorination Systems for your fresh cut food processing equipment needs. We custom design any size job – from one machine to your complete plant line. 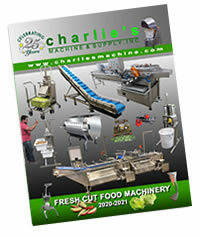 At Charlie’s Machine & Supply we offer a full line of new and used fresh cut fruit and vegetable processing equipment. A sampling of our equipment is listed below. As you move through our website we have embedded video demos for most of our equipment to enhance your experience with the equipment. We specialize in fulfilling your equipment processing needs including after-sales service and parts supply needs - from the smallest to the large fresh cut processors. Download our 2015-16 catalog today! Charlie’s Machine & Supply understands your specialized processing applications.